In the middle of the Jordaan in the eerste Anjeliersdwarsstraat we offer this fantastic and tastefully decorated apartment. A staircase leads to the entrance on the first floor. The hall gives access to the separate toilet, the bathroom, the master bedroom and the bright living / dining room with open kitchen. The living room gives access to the second bedroom. The bright living room is furnished with a comfortable sofa, a large TV and a dining area. The open kitchen is fully equipped with, among other things, a 5-burner gas stove with oven, extractor hood, fridge, freezer and microwave. The large bedroom has a double bed and plenty of cupboard space. The second bedroom has a single bed and cupboard space. The luxurious bathroom has a shower, sink and design radiator. There is a separate storage room in the basement. 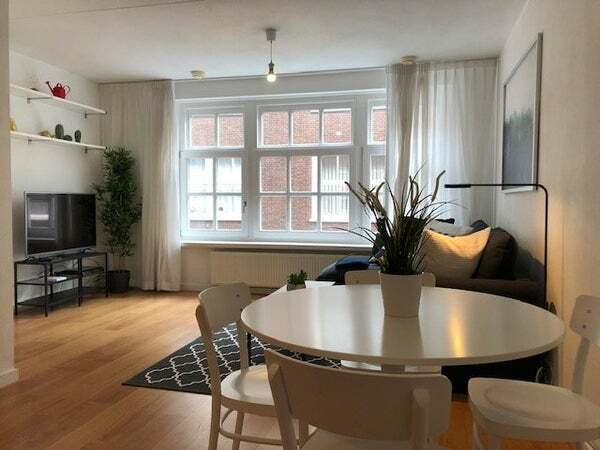 This beautifully finished apartment is in the middle of the Jordaan. Boutiques, cafés, restaurants, supermarkets, the Noordermarkt and Lindengracht are within walking distance. The Noordermarkt has a fabric market every Monday and the organic market on Saturdays. Here farmers from the Amsterdam area sell their organic food such as meat, fish, bread, cheese and other delicacies. Public transportation is around the corner. The Central Station with the North-South line is 5 minutes by bike.